Have you ever wondered how it is that our intrepid adventurers maintain body heat on the wild tundras of the Adelaide Hills? 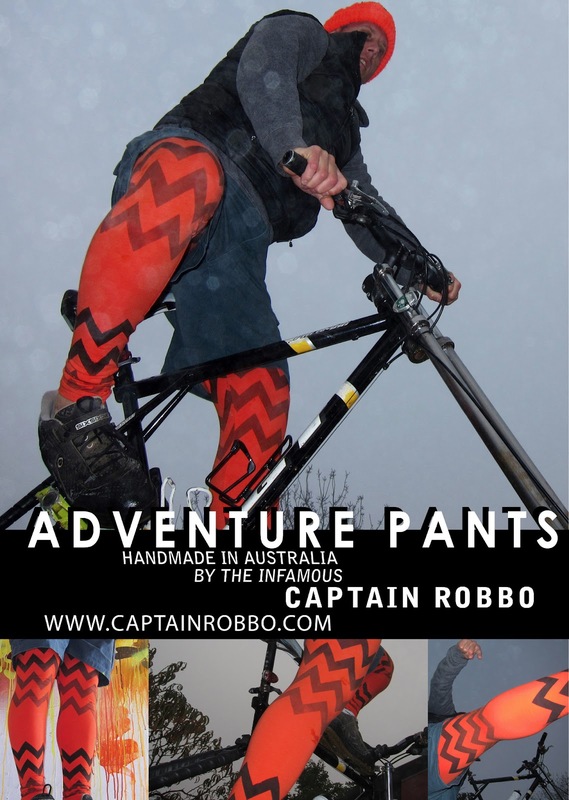 Here's the secret - Adventure Pants! Made from Australian fabric and hand printed in Melbourne, these high quality garments have been seen wrapping the pins of the finest tradies, outdoor athletes and rock stars. These are my own personal choice for their cotton construction, sans fleece, allowing a high level of breathability and their resistance to the mobile sauna outcomes of other similar products. They also are perfect for my application in their own fusion of both art and adventure. Beyond my completely objective rant I make note that my services are available for the promotion of any Australian made product that makes use of the word 'adventure' in it's title. I am also open to alliances between any handmade products that assist in the pursuit of high end freaky adventuring. Stay warm kids - you know how!